Invented by a board certified emergency physician, WoundZipper™ incorporates powerful, flexible magnets encased in a rubber-like, medically safe plastic. Hypoallergenic adhesive holds each WoundZipper™ component securely in place. Faster than staples or sutures. No waiting for anesthetic to take effect. Less trauma, especially for babies and young children. Easy to inspect and reclose wound. Perfect for high anxiety emergencies, especially when medical personnel are overloaded. No staples or sutures to remove. No need for syringes, needles, staple guns, or other disposable accessories. Available in one-centimeter increments from sizes 3cm-10cm. 1. The laceration before the application of WoundZipper. 2. WoundZipper being rolled into place on the most irregular edge of the wound: taking care to align the wound edge with WoundZipper and orienting the arrows toward the wound center. 3. Top view of second WoundZipper component being "rolled on" while holding components slightly apart. Note that the arrows of second component point to the arrows of the first, assuring magnetic attraction. 4. Closed wound with components in contact. 5. Removal of WoundZipper component by lifting and rolling back. WoundZipper™ is a magnetic wound closure device that re-approximates wound edges, leading to improved healing. 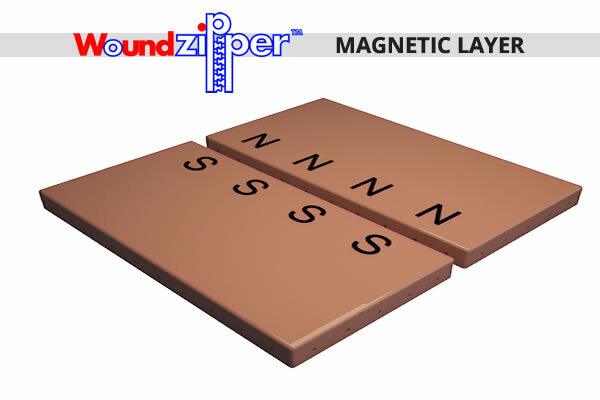 When the two WoundZipper™ components are attached to the skin on opposites sides of a wound, magnetic attraction pulls the edges of the wound together. Placement of the device on a patient is faster than using staples or sutures. No need to wait for an anesthetic. No painful injections are needed, avoiding additional trauma. Inspection of the wound is simple because the device is easily removable. The devices can be easily manufactured in a variety of sizes and shapes that accommodate various wound sizes. The magnetic wound closure device is used as a pair of magnetic wound closure devices aligned in opposite polarity with respect to each other so that the magnetic edges of each device attracts the polar opposite edge of another device. In one embodiment, each of the magnetic wound closure devices has a magnet, an insulation layer adjacent to the magnet, an absorbent layer adjacent to the insulation layer, a polymer layer that has a plurality of holes capable of draining wound secretions to and from the absorbent layer, and an adhesive layer adjacent to the bottom surface of the polymer layer. The adhesive layer allows the magnetic wound closure device to adhere to the surface of the skin of a patient. The interior edges of each magnet are oriented in opposite polarity to each other, and on opposite sides of the wound (with the wound between the two magnet closure devices). Since the two magnetic wound closure devices surround the wound are drawn toward each other, thus making the wound opening smaller, and thereby allowing the wound to heal more quickly.